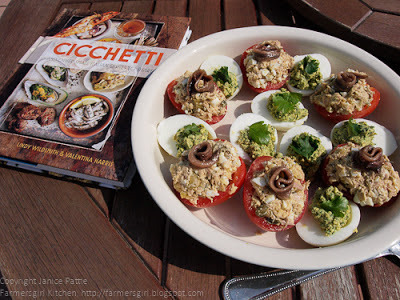 Farmersgirl Kitchen: CICCHETTI and other small Italian Dishes - Review and Giveaway! CICCHETTI and other small Italian Dishes - Review and Giveaway! Cicchetti are the Venetian equivalent to tapas, served in bars, bacari and other eateries. Outside Venice these special snacks are not called cicchetti, but spuntini, piccolo cibi and stuzzichini. 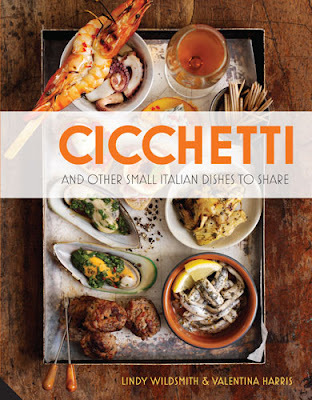 CICCHETTI is a book divided in two, the first half written by Lindy Wildsmith celebrating the Venetian tradition, the second half written by Valentina Harris, featuring delicious bites from other areas of Italy. Italian, runs Italian cookery courses and has an in-depth knowledge of Italy and its gastronomy. blog, grown-upfood.blogspot.com, and you can follow her on twitter @lindywildsmith. VALENTINA HARRIS has enjoyed a long career writing and teaching about authentic Mediterranean dishes. She has carved herself a career as a self-styled ambassadress and expert on Mediterranean gastronomy and diet, and has written over 30 books on Italian food, where she shares her food philosophy of using local, seasonal produce to make dishes with maximum care and minimum fuss. She now lives in London and teaches at several cooking schools when not writing and offering her services as a consultant and private caterer. There are several pages of introduction to Cicchetti telling you about the dishes, the area and providing 'the basics', advice on deep frying, lard, polenta, Crostini and Crostoni. Including various versions of Polpettine, deep fried fish balls, Black cuttlefish stew with polenta, Gratin of mussels, Jewish-style salt cod fritters, Soused Sardines, Hot Smoked Trout and mustard bites, Fresh Shrimp in parsley dressing. Including Hard Boiled Egg Halves (see recipe below), Ricotta and pancetta crostini, Deep-fried polenta sticks filled with stracchino cheese. Including Crepe pouches with vegetables, Broad Bean tartines, Sweet and sour pumpkin stuzzichini, Aubergine patties, Risi e bisi. Including Cotechino sausage with mushrooms and polenta, Meatballs made with beef, Carpaccio of beef fillet with asiago cheese. This chapter is all about the drinks of Venice, they even have their own word for a relaxing drink: ombra, which means shade and relates to when portable wine bars used to follow the shadow of the Campanile bell tower across St Mark's Square. Including Bellini, Negroni, The Florian spritz, The Trieste spritz, Lemon sorbet with prosecco and vodka, and Cumin Seed flavoured grappa. Including Stuffed mini pancakes with broad bean cream, Cocoa-dusted baby onions, Rich Melted Cheese on toast, Mint, garlic and ricotta pasties and Pan fried hazelnuts. Including Vegetable Fritters, Fried sun dried peppers and Spicy sauteed vegetable crostini. Including Stuffed Aubergine rolls, Stuffed Tomatoes (see recipe below), Mini pizzas with spicy salami, Calabrian ricotta pizza and Fresele with tomatoes. Including Tuna parcels, Mussels with basil on crusty bread, Basic tomato sauce with garlic and Pancake rolls with mussels. Including Mini calzoni, Mini fritto misto of fish, Neopolitan cheese loaf and Neopolitan scrambled eggs. Including Roman rice fritters, Prawn fritters, Mozzarella in a golden carriage, Bruschetta with langoustines and Hot polenta flour buns with sultanas and rosemary. Including Deep-fried capers, Meatballs wrapped in lemon leaves, Chickpea fritters and Sicilian marinated olives. Including Eel wrapped in vine leaves, Tuna bites with olives and pancetta, Fish empanadas and mini ricotta frittata. Including Tuscan pate on toast, Stuffed baby squid, Tuscan oil and garlic toast and Mini bread rolls with garlic and anchovies. Pancetta and rosemary pancakes, Baked cheese twists, Stuffed courgettes flowers and Pecorino with fresh broad beans. Including Mortadella, asparagus and parmesan, Deep-fried ravioli, Dates wrapped in Parma ham, Parmesan biscuits and mini lamb cutlets in the Bolognese style. Including Focaccia with cheese, Deep-fried herbs, Esater Pie, Mini mozzarella balls with mint and chilli and Mini frittata with fresh herbs. Including Crispy balls with a melted cheese centre, Pumpkin tartlets and Bresaola rolls with arugula. Including Rustic tartlets, Goat's cheese balls with walnuts, Golden Cheese bread, Pastry crescents with ham and fontina, Baked stuffed onions, Piedmontese cheese fondue and Polenta crostini with mushrooms and cheese. Including Savoury ricotta, onion and speck pie, Onion bread rolls and Fresh mushroom salad. Including Speck and Asparagus tart, Savoury strudel and Spiced almonds. Including Stuffed and deep fried green olives, Savoury Cake with anchovies and vegetables, Pastry with pecorino and Roasted razor clams. If you love Italian food you will really enjoy cooking from this book. There are plenty of vegetarian recipes although less for the vegan cook. Beautiful photographs of many of the recipes, excellent introductory information about the food from each area, a bit of a travelogue as well as a cook book. Some of the recipes use ingredients which can be expensive e.g. artichokes, scallops etc. There are also a number of recipes which use offal which many people are not keen to cook or eat. The book is well laid out and I found the two recipes I made easy to follow. Ingredients are given in metric measures. 1. Put eggs in a small pan and cover with cold water. Put on a medium to high heat and bring to the boil. 2. Simmer for 10 minutes and then put the pan under running cold water. 3. Drain, tap the eggs to crack the shell and leave to cool. 4. Finely chop the anchovies and flat-leaved parsley and then work them to a paste with a pestle and mortar. 5. 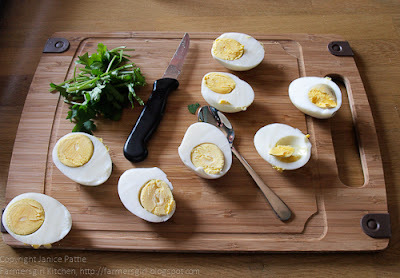 When the eggs are quite cold, cut in half length ways. Turn the yolks out and add them, with a good grinding of pepper, to the anchovy and flat-leaf parsley paste, and mix until smooth. 6. Fill and mound up the egg-white cavity with the mixture, top each one with a small leaf of flat leaf parsley or an anchovy roll and arrange on a serving dish. 1. Slice the tops off all the cherry tomatoes and use a teaspoon to carefully scoop out the seeds. 2. Sprinkle each tomato with a little salt and turn them upside down in a colander or a cooling rack placed over a tray to drain. 3. Chop the tomato tops finely and set aside. 4. Drain the tuna, reserving the oil. Flake the fish with a fork and mix it with the ggs, tomato tops, capers and olives. Add a little of the reserved oil to moisten if required. 5. Mix the anchovy paste with the mayonnaise and lemon juice, then mix this in with the tuna mixture. Fill each tomato to the top with the mixture and place a halved anchovy fillet on the top t serve. 6. Chill until required, but do not serve ice-cold. 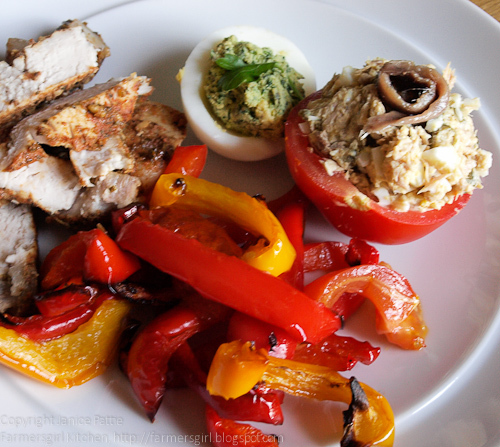 I served the Cicchetti with roasted peppers and spicy marinated pork chops. 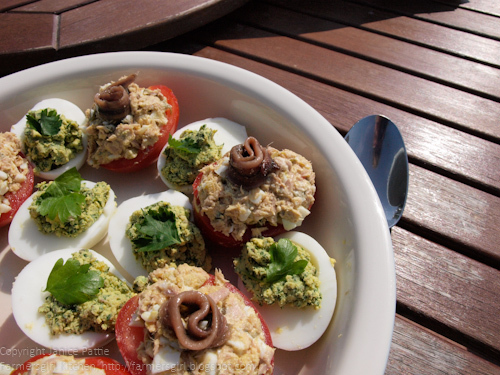 The flavour of the eggs and tomatoes felt very authentic and Italian, they would be great for buffets and parties, tasty little bites indeed! This is a well researched and produced book, just as you would expect from such experienced authors. It's is a book that would be great for people who entertain and are looking for interesting and different appetisers or canapes. I enjoyed reading and cooking from the book and there are a number of recipes which I have bookmarked to try, in particular the Chickpea Fritters which sound like they may be very like the Chickpea Chips I enjoyed in Cheltenham! To order Cicchetti at the discounted price of £16.00 including p&p*, telephone 01903 828503 and quote offer code JS227. Or send a cheque made payable to: Littlehampton Book Services Mail Order Department, Littlehampton Book Services, PO Box 4264, Worthing, West Sussex BN13 3TG. Please quote the offer code JS227 and include your name and address details. *UK ONLY - Please add £2.50 if ordering from overseas. Love caponata - such a simple dish, but so tasty! Nice review Janice. I love Italian food and because they are so keen on vegetables, there are plenty of vegetarian recipes. Love pasta in all forms and various pesto sauces. Wow! I'd love to try out an Italian take on tapas. The book looks amazing. I love pasta with light tomato sauces and I like a Tuscan style rabbit dish with herbs and pancetta. I love olives in everything too! Anything with pasta. I can eat pasta till it comes out of my ears!